Atlanta, GA (March 22, 2018) – The National Black MBA Association® (NBMBAA®) recently announced its partnership with Johnson & Johnson – the world’s largest and most broadly-based health care company. This partnership was created in an effort to break new grounds on everything from company culture and forward-thinking business practices, to diversity in the workplace, social responsibility and more. 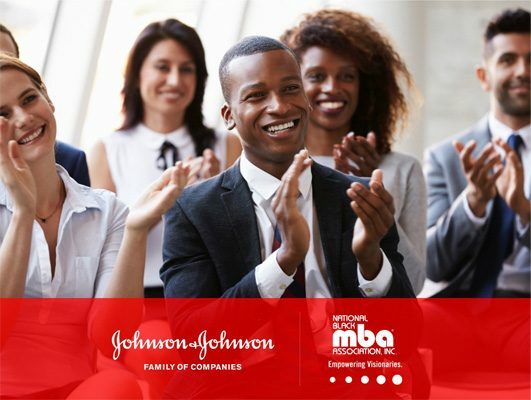 The partnership between NBMBAA® and Johnson & Johnson was created to fashion a strategy that will enhance growth and opportunity for NBMBAA’s audience, create awareness around J&J’s work culture and optimize ongoing awareness of the company’s commitment to diversity and inclusion. Both NBMBAA® and Johnson & Johnson strive to expand and accelerate a culture mobilized around the improvement of inclusion and diversity, as well as integrating dedication to values, forward-thinking ideas and cultural advancement for everyone. Together, the results from this partnership have the potential to provide NBMBAA® members with career opportunities while helping Johnson & Johnson further diversify recruitment and talent acquisition in the future. NBMBAA® is a non-profit, 501(c)(3) professional member-based organization which leads in the creation of educational and career opportunities for black professionals. Representing more than 12,000 members within 30 professional chapters, 33 Leaders of Tomorrow (LOT) chapters and 300+ corporate and university partners, the organization is dedicated to developing partnerships that create intellectual and economic wealth in the Black community through its five channels of engagement: career, education, entrepreneurship, leadership and lifestyle. For more information, visit www.nbmbaa.org. At Johnson & Johnson, we believe good health is the foundation of vibrant lives, thriving communities and forward progress. That’s why for more than 130 years, we have aimed to keep people well at every age and every stage of life. Today, as the world’s largest and most broadly-based health care company, we are committed to using our reach and size for good. We strive to improve access and affordability, create healthier communities and put a healthy mind, body and environment within reach of everyone, everywhere. We are blending our heart, science and ingenuity to profoundly change the trajectory of health for humanity. To learn more about Johnson & Johnson, visit www.jnj.com.